This chapter describes state-of-the art techniques to improve performance of spectrum sensing and spectrum management in Cognitive Radio Networks (CRN) by leveraging services available in cloud computing platforms. CRNs are capable of adaptive learning and reconfiguration to provide consistent communications in dynamic environments. However, ensuring adaptation and learning in CRN will require availability of large volume of data and fast processing. However, the performance and security of CRN is considerably constrained by its limited power, memory and computational capacity, it may not be able to achieve its full capability. Fortunately, the advent of cloud computing has the potential to mitigate these constraints due its vast storage and computational capacity. In the past decades, various wireless systems such as cellular phone systems, wireless local area networks (LANs) and wireless personal area networks (PANs) are deployed successfully. Broadband wireless access systems are going to be implemented in near future. All wireless systems provide different services but they have different capacity, associated cost and quality-of-service (QoS), handover, coverage range, etc. Existing wireless systems use different radio frequency (RF) spectrum bands and most of the current spectrum assignments are done statistically to the service providers for exclusive use on a long term basis and vast geographic area. The exclusive spectrum licensing by government regulatory bodies, such as the Federal Communications Commission (FCC) in the United States, and its counterparts around the world, is for interference mitigation among different service providers and their service users. However, the static assignment of RF bands results in inefficient use of spectrum since most portion of the spectrum remains under-utilization (Akyildiz et al., 2006). Furthermore, as RF spectrum is scarce commodity in wireless world, its static assignment leaded to scarcity of spectrum which is serious bottleneck for the development and deployment of newer wireless systems. 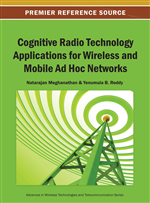 Cognitive radio (CR) technology is an emerging concept to increase the spectrum efficiency which uses the spectrum opportunities dynamically without creating harmful interference to licensed/primary users. CR users, also known as secondary/unlicensed users, form a cognitive radio network (CRN) and do not have their own dedicated or licensed spectrum bands but are capable of sensing or searching and using spectrum opportunities dynamically. In CRNs, secondary users can share and coexist with primary users in the same spectrum band or can use idle spectrum bands that are not used by primary users. Sense the environment: This is cognitive capability of CRs to identify the frequency band not used by licensed primary users or to make sure that the cognitive radio is not creating harmful interfere to primary users. Analyze and learn sensed information: This is related to self-organizing capability based on sensed information. Adapt to the operating environment: It is a re-configurable capability of CR where it chooses the suitable parameters such as frequency, transmission power, modulation, etc. It is worth noting that the main capabilities of CR users heavily depend on sensed information from which they analyze and learn and then adapt their own operating parameters accordingly. There are two basic approaches for dynamic spectrum access in CRNs (Akyildiz et al., 2006, Haykin, 2005): spectrum overlay and spectrum underlay. In spectrum underlay approach, secondary CR users coexist and transmit simultaneously with primary users sharing the licensed bands however CR users are not allowed to transmit with high power as they are not allowed to exceed the interference limit to the active primary users. In this approach, CR users do not have to sense for spectrum opportunities. In spectrum overlay approach, CR users require to sense or search and identify the spectrum opportunities in licensed bands before using them for given time and geographic location, and use those opportunities dynamically. Secondary CR users can use spectrum opportunities dynamically until the primary systems want to use them. Frequency bands used by active primary users should not be used by secondary CR users. For returning primary users, CR users must vacate the band as quickly as possible (Poor & Hadjiliadis, 2009; Haykin, 2005). The main challenge in spectrum underlay approach is to transmit with low power so as not to exceed the tolerable interference level at primary users. However, in spectrum overlay approach, the major challenge is to sense, analyze and identify the spectrum opportunities in the wide band regime reliably and optimally.